While the U.S. House of Representatives chamber filled for a vote today at 4:40pm, Representatives’ eyes and ears turned toward the Chamber’s gallery as a group of activists interrupted proceedings to call for the closure of Guantanamo Bay prison and denounce provisions in the Defense Appropriations Bill concerning detention policy. “Today the House of Representative is in the process of contemplating not the passage of a bill but the commission of a crime. Provisions in the proposed Defense Appropriations Bill grant the United States powers over the lives of detained men fitting of a totalitarian state that uses the law itself as an instrument of tyranny. The law would make the prison at Guantanamo permanent by denying funds for the transfer of men to the United States, even for prosecution in civilian courts. The activists were removed from the gallery by the police and placed under arrest. They will likely appear for arraignment in District of Columbia Superior Court on Friday. Earlier today, before entering the House chamber, members of Witness Against Torture, the Torture Abolition and Survivor Support Coalition (TASSC), Amnesty International and other groups embarked on a March of Shame, walking between the institutions in Washington DC that continue to be responsible for unjust, illegal, and immoral American policies and conduct. Beginning at the White House at 11am, the anti-torture activists, dressed in the orange jumpsuits and black hoods that are now emblematic of the policies of torture and abuse that the Obama administration inherited from President George W. Bush and has further entrenched. Then the group solemnly processed to the Department of Justice, the Supreme Court, and the Capitol. 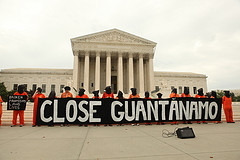 The demonstrators called on all branches of government to close Guantanamo, end indefinite detention, repudiate the Military Commissions, and resist any effort to reauthorize torture in the form of “enhanced interrogations.” The procession took place as the House of Representatives is dealing with a version of the 2012 defense appropriations bill that undermines US Federal Courts, keeps Guantanamo open, and attempts to expand indefinite detention.